Tuesday night was a rough one for D.C. Mayor Muriel Bowser as three of her allies on the D.C. Council lost their Democratic primaries, and former Mayor Vincent Gray's comeback could spell even more trouble. Bowser wasn't on the ballot, but the political landscape changed for her with Gray defeating Council member Yvette Alexander in Ward 7, Trayon White winning Ward 8 over Council member LaRuby May and Council member Vincent Orange losing his at-large seat in the primary against Robert White. “Voters came out to speak, so we will look forward to working with new members of the council,” Bowser said. 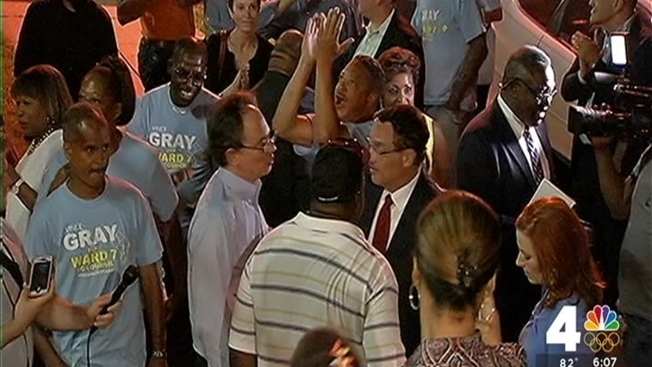 Gray lost the 2014 mayor's race to Bowser during an investigation of his 2010 campaign. His Ward 7 win offers some vindication, and now Bowser must face him on the council. “That’s how I worked with him when he was the mayor, and so that's how legislatures and executives work,” she said. Appearing on WAMU radio Wednesday, Gray said he could put aside personal feelings of his 2014 loss to Bowser. “I don't have any intention to simply use this as an opportunity to throw rocks or to poke at Mayor Bowser,” he said. But Gray won't rule out a possible run for mayor, and he said the three council losses were a statement of Bowser's poor leadership. “It seems to me that it's a repudiation of some of the things that have occurred over the last year and a half,” he said. Council members who congratulated Gray Tuesday night said the mayor may have to work with a less compliant council on homeless, crime and other issues. “I think the council will actually be more cohesive with these wins because I think that you’ll have the greater independence of judgment,” Council member Mary Cheh (D-Ward 3) said. “We’ll get, hopefully, a more deliberative body that's independent thinking and not just looking for votes,” Council member David Grosso (I-At-Large) said. New council members don't take office until Jan. 2, giving Bowser time to adjust.